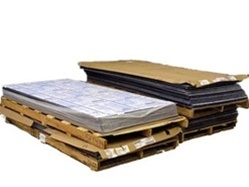 .118 LEXAN SHEET CLEAR FMR 72"x96"
SPECIAL SHIPPING NOTICE: Please note that this item cannot be shipped by UPS and other small package carriers. This item, shipped in its full size width and length will need to ship via "common carrier" (Truck). Your order will incur additional shipping expense and or handling fees. Please contact Precision Plastic Products Inc. at (800) 245-3774 for approximate shipping costs.